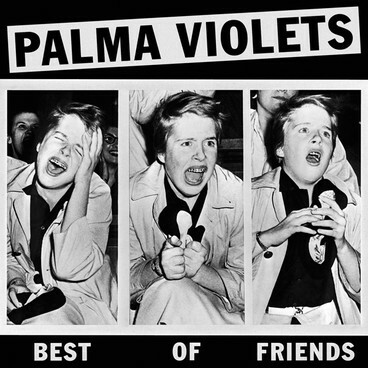 So today band-I-caught-at-Reading-thanks-to-Bill-and-then-discovered-they-have-massive-internet-hype Palma Violets have (finally) actually recorded a song and put it onto the internet. This takes from the realms of a band the nme can tell you are great to an actual band that you can judge for yourself. The end result: we can now see If Palma Violets Are Any Good. And… It’s good. Really Good. Good enough that the nme can brand it ‘one of the catchiest guitar songs in years’. Which is all fair enough but the nature of the band, a british guitar rock group with two equally talented and charismatic frontmen means that the easy comparison to go to is The Libertines, not to mention that there’s plenty of room to call in Joy Division too. And all of this means that the inevitable ‘Can Palma Violets… [insert cliché here]’ articles are just around the corner from the music press that must be the best in the world for overhype. Only last year it was proclaiming The Vaccines the saviours of Rock’n’Roll and Arctic Monkeys-esque working class heroes (until they found out they were actually comfortably middle class). So before a good new band is suddenly shoved on magazine covers and asked to rescue us from some sort of musical lull where Only They Can Save British Music, let’s hold back on the hype. Do we really want to have to face another awkward moment where we sit back and go… “well they were alright”. The most ironic thing in all of this, is that any hope there is of a British Rock Band repeating the success of a band like The Libertines or the Arctic Monkeys is if we just leave them alone, let them gather their deserved following online and at gigs, and then when the band is ready and developed and mature, it can put out that album that will Save British Rock. And can Palma Violets make that album? Maybe in two years, yes, they probably could.